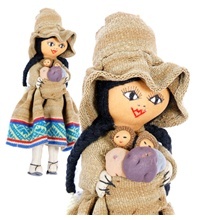 Hand spun sheepswool is hand woven on a traditional backstrap loom to create these stunning traditional dolls in Andean dress. The dolls are holding potatoes and/or babies, and also have a tiny baby swaddled on their back. They are made in Chinchero.